The three works on this recording are collections of short pieces, strung together and forming a cohesive whole � a form which Schumann himself invented, developed and brought to perfection. 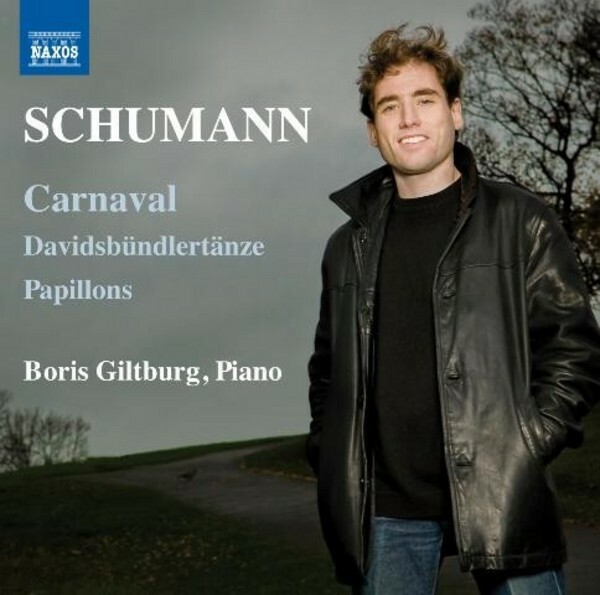 Davidsb�ndlert�nze (Dances of the League of David) was written after Schumann�s engagement to Clara Wieck, to whom he wrote, �If I have ever been happy at the piano, it was when I was composing these.� Papillons (Butterflies) is the work of a youthful, unfettered imagination, and Carnaval is one of his most popular pieces, a display of both technique and emotion. Boris Giltburg, who took first prize at the 2013 Queen Elisabeth Competition, is one of today�s most thrilling young pianists. This release marks the start of an exciting new collaboration with Naxos. Pianist Boris Giltburg was born in 1984 in Moscow and has lived in Tel Aviv since early childhood. He began lessons with his mother at the age of five and went on to study with Arie Vardi. In 2013 he took first prize at the Queen Elisabeth Competition, having won second prize at the Rubinstein in 2011 and top prize at Santander back in 2002, subsequently appearing across the globe.